This TV Stand For 47" Flat Screen Television Sets Up Quickly! This TV Stand Makes a Stylish Display and Requires No Tools! TVStandsOnly.com Is Your Online Source! Display includes (2) TV stands for holding up to 50" television weighing up to 80 lbs. Pop-up counter assembles quickly with no tools required. Mural measures 10' x 7.25' tall to create a highly visible exhibit! Carrying cases/bags for all units for easy transport to and from events. This TV stand for 47" flat screen television is perfect for use at tradeshows, exhibitions, and conventions. Different items are included, so that your company can create an effective presentation that uses your Sony, Toshiba, Vizio, or other monitor. 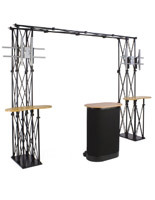 The TV stand incorporates (2) black truss TV stands that each support up to a 50" television, weighing less than 80 lbs. Each stand assembles with virtually no tools, as the rods are self-screwing. The TV stand uses a pop-up counter display that, similar to the TV stand, requires no tools! This counter sets up quickly, and has a large tabletop for placing items. 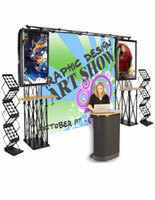 The tradeshow display, TV stand has hook and loop receptive material to place various accessories such as literature holders and graphic mounts. Within the counter are (3) smaller shelves for placing additional merchandise. 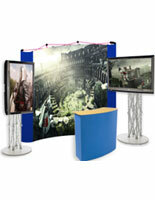 The TV stand has a large mural banner frame featuring high-resolution, 1200 dpi panels with your company design. The mural is 10' wide x 7-1/4' tall, easily standing out in any location. The TV stand also has a molded hard plastic case for shipping and transport. Custom banner graphics are printed directly onto 22mil PVC panels with a matte finish. The key feature of these panels is they do not tunnel or separate, even after years of rolling and transport! This case has wheels to easily bring the unit to your spot on the show floor. 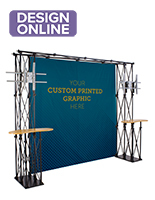 Buy these great tradeshow units for your next company event! Please Note: Though the VESA LG bracket is meant to work with 200mm x 200mm VESA compatible televisions, the design of this stand allows for only 300mm x 300mm to 600mm x 400mm to be used. 18.0" x 37.5" x 15.0"
120.5" x 87.9" x 35.5"
61.5" x 37.5" x 15.0"